Ecobee3 vs. Ecobee3 Lite vs. Ecobee4 — Who's the Best Smart Thermostat? Interested in the ecobee lineup of smart thermostats, but can’t decide which one is right for you? You’re not alone. Each of the ecobee models has new features, but because of their similar looks, it can be really hard to tell the models apart. In this head-to-head three-way comparison, we’re going to break down the features and specs of each model. Read along as we dive into an in-depth comparison of ecobee smart thermostats—Ecobee3 vs. Ecobee4 vs. Ecobee3 Lite. The ecobee name is a Canadian-based company that designs and manufactures home automation tools in pursuit of a “Smart Home.” Its main lineup of products includes smart thermostats, some of which double as smart home hubs. The ecobee smart thermostat has a modern look, and honestly, it can be hard to identify differentiating features between models. This guide is going to break down three of the company’s newest models: the ecobee4, the ecobee3, and the ecobee3 Lite. Depth from wall 1.0" 0.8" 0.9"
Display Size 3.5" 3.5" 3.5"
The designs of the ecobee smart thermostats are all strikingly similar, as mentioned above, but that’s not to say there are not small differences in the overall design of these units. Between the three, there is no change to the screen size (3.5″ x 3.5″) or display resolution (328 x 480). All three have touch screens with similar features and setting buttons on the display. Considering the exact features on the display, here are a few things that are different between the ecobee4, ecobee3 Lite, and ecboee3. MOTION SENSOR | On the ecobee3, the motion sensor is located on the bottom left corner of the unit and is noticeably different from the rest of the display. On the ecobee4 and ecobee3 Lite, it takes a more discreet approach and the sensor is designed into the body of the unit and is not noticeable from the front of the display. OVERALL SIZE | Overall, all of the ecobee smart thermostats are basically 4″ x 4″ and about an inch off of the wall. But if you are looking for something more exact, check out the following dimensions detailed out in the table below. As you can see, the exact size does slightly vary based on the specs. AMAZON ALEXA | For users concerned with voice control, this is a big design change between the ecobee3 / ecobee3 Lite and ecobee4. The ecobee4 has an additional display icon that allows you to access Alexa and signifies its voice control technology. This is something that is entirely unique to the ecobee4 and the only unit in the ecobee lineup that includes this feature. Wonder how Ecobee compares to Nest? We’ve got you covered with our Ecobee vs. Nest battle. The accessories included with these ecobee smart home thermostats are minimal, to say the least. They all include the same basic parts, but similar to the details above, there are a few minor differences. The backplate is the accessory that is required to install your thermostat. Each backplate looks slightly different, but the backplate helps to show exactly how to connect the new unit, based on the specs of your existing unit. Wire connectors are clearly marked and snap into place for a quick and relatively painless install. If your existing unit was larger than the ecobee (and you don’t want to tackle drywall repair), ecobee includes an additional trim plate with extended coverage. This trim plate mounts directly on the wall, under the backplate and helps to cover any holes or other wall damage that is behind your ecobee. If you prefer a different color or material, you can find other trim plates from third-party retailers. If your air conditioning unit doesn’t have the C wire you may need to use the power extender kit. This provides power the ecobee smart thermostat. Room sensors are small stand-up sensors that can be placed in any room, and they allow the ecobee to track and control the temperature of that particular room more precisely. This is great for areas that you are in more often, allowing the secondary (and less used) areas of your home to take a back seat. Room sensors are compatible with all ecobee models listed here, but only come included with select models. If this is an important feature, be sure to check the exact model package you are purchasing to see if these are a part of the bundle. You can also purchase ecobee room sensors separately, after your initial purchase as well. They are sold as a pack of two sensors. To really get a feel for how the ecobee performs I purchased the ecobee4 and installed it in my home. I’ve been using the ecobee for some time now and tried to get a feel for all of the various features and methods of controlling the thermostat. Below you can see our complete experiences on unboxing, installation, usability, and more. Out of the box, all of these models are similar. Each ecobee comes with the same accessories (give or take the room sensors). The ecobee4’s packaging is simple and cleanly laid out. There is a simple setup guide with instructions on how to install the ecobee. To install the ecobee, there are diagrams that show how to correctly wire it into your existing HVAC system. With any of these models, ecobee is quite proud of its products’ easy of installation for DIYers. UNINSTALLING YOUR OLD SYSTEM | All ecobee models come with a series of small stickers that correlate with the wire designation of each connection. You can use the sticker to label the wires accordingly before completely uninstalling your old system and then use that labeling system to identify the correct locations on your ecobee. While we were uninstalling the old system we made a point to take a picture of the previous thermostat wire configuration, just in case something got messed up along the way. 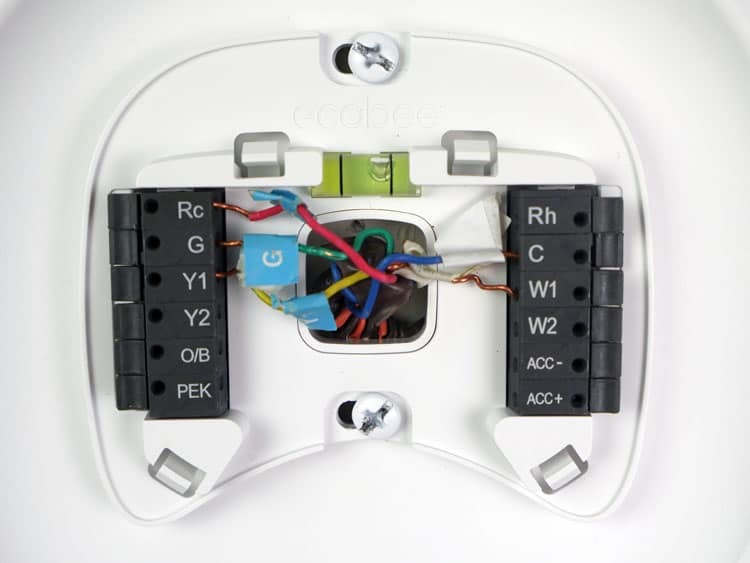 INSTALLING ECOBEE | When you’re ready to install the ecobee, you can use the pre-labeled wires to connect to the correlating ports on the ecobee backplate. Regardless of whether or not it is an ecobee3, ecobee3 Lite, or ecobee4, every model is extremely similar up to this point. The wiring and terminal configuration may vary a bit depending on your exact unit. However, most ecobee4 units will include a terminal configuration similar to this. The ecobee3 Lite is substantially similar to the ecobee4. The only major difference between the ecobee4 vs. ecobee3 lite is that the ecobee4 includes additional terminals, which would allow you to connect additional heating and cooling hardware (if you have it). The Ecobee3 is a bit different compared to the Ecobee3 lite and Ecobee4 thermostats. It places the W1 (AUX1) wire on the left side of the board, and has a few extra terminals (compared to the Ecobee3 lite), similar to the Ecobee4. Just as with the Ecobee4, this would allow additional heating and cooling hardware systems to be installed (if present). Whether you have the Ecboee4, Ecobee3 Lite, or Ecobee3, if you’re struggling with the install or have a more complicated install, see Ecobee’s installation help page here. This page has tons of information, as well as more videos and diagrams to help manage the setup and installation process. Using any of the ecobee smart thermostats is simple. The Ecobee4, Ecobee3 Lite, and Ecobee 3 are all similar when it comes to usability. You can adjust your thermostat temperature, as well as all of the settings directly on the touchscreen display. Simply tap the display to activate the screen and then touch, hold, and drag to increase or decrease the temperature in your home. If you need to adjust more complex settings you’ll need to touch through the various menus. During our tests of the ecobee4 we found the touchscreen to be responsive and easy to use. In addition to the touchscreen display, you may also adjust your heating / cooling system using the Ecobee app, available on both the Google Play store as well as the iTunes app store. The app is simple and has an interface similar to that of the touchscreen. Using the app, you’ll be able to control your thermostat from anyone in the world with an internet connection. My one complaint on the app is I found it rather slow on the initial load time. It took my phone around 10 seconds to start the app (for reference, I use a Samsung Galaxy S8). Once the app is loaded, there were no delays between pages or functions within the app, but the initial app load time was certainly longer than expected. If you have a smart hub you’ll be able to integrate any of the ecobee smart thermostat systems into your larger smart home system. During our test of the ecobee4, we used the Amazon Alexa built into the ecobee4 itself. Through this, we added additional smart home products and were able to control them all via the Amazon Alexa app. Last, but not least, voice control. The ecobee4, ecobee3 lite, and ecobee3 can all be controlled via voice control. However, the ecobee4 is the only thermostat that has Amazon Alexa built in. So if you want to control your thermostat via voice commands on the ecobee3 or ecobee3 lite, you’ll need a standalone Amazon Alexa or Google Home device that you can give verbal commands. If you want even more automation around the home, see our complete smart home guide, or check out our reviews on robot vacuums and robot mops (the Roomba 690 and Braava 380t are particularly great). Depending on the exact setup of your system, it is possible that one ecobee may suit you better than another model. But if you have a basic system, you can make a decision based on features alone. FOR THE COMPLICATED SYSTEM | If you have a complicated HVAC system, your best bet is likely going to be the ecobee4. The ecobee3 and the ecobee3 Lite do not support added accessories, like a humidifier, dehumidifiers, ventilators, ERVs, or HRVs, which can be common additions in multi-terminal systems. FOR THE BEST DEAL | For the best deal, it’s hard to beat the ecobee3 Lite, especially if you don’t have any particularly difficult needs or complicated setups. It has the majority of features found on the ecobee4, besides advanced compatibility, but if you don’t need those extra wire terminals, this is likely a feature that you will never miss. Aesthetically, the ecobee3 Lite is also about 1/4″ smaller and a little thinner as well. Financially, it also makes good sense, being that the ecobee3 Lite is less expensive than the ecobee4. FOR THE EASIEST TO USE | As far as usability goes, it’s really hard to beat the ecobee4. Granted, none of the ecobee models are particularly difficult to use. However, I really like that the ecobee4 has built-in Amazon Alexa. It’s a feature I didn’t think I would really care about, but during testing I found it to be really cool. It’s incredibly nice to be able to just walk by the thermostat and call out to Alexa to turn up or down the AC. Should You Buy the ecobee4, ecobee3 Lite, or ecobee3? So here we are at the end of the review of ecobee. Do you feel confident to make a decision about which model is right for you? If not, let’s hit the high points one more time. The guide below will give a 30-second summary as to which model I’d recommend for whom. Want advanced compatibility – If your existing HVAC system is especially complicated or you have additional accessories, like humidifiers, dehumidifiers, etc, the ecobee4 is going to be the smart thermostat for you. It comes with additional terminals that make it possible to connect unique systems or accessories. Want built-in voice control – The ecobee4 is also the only one that comes with built-in voice control via Amazon Alexa. Built-in Alexa means that you don’t have to pair the ecobee with an Amazon Dot, Spot, or Echo. This transforms your smart thermostat into…well almost anything. Ask Alexa to set a timer, tell you the weather, or look up information. When paired with other smart home devices, your ecobeee can serve as a hub to all sorts of jobs; turn on lights, lock doors, close your garage—basically whatever you desire in a smart home. Click here to check the ecobee4 price on Amazon.com. Who should buy Ecobee3 Lite? Want a great deal – It’s no surprise that the ecobee3 Lite is quite a bit less expensive than the ecobee4. For simple HVAC systems or smaller homes, this unit is more than sufficient to get the job done. Click here to check the ecobee3 Lite price on Amazon.com. Who should buy the Ecobee3? Regarding the ecobee3, I’m just not sure there is ever a time I would recommend it over the ecobee4 or the ecobee3 Lite. The ecobee3 Lite came out after the ecobee3 and really does a great job of filling all gaps. If you need something more advanced and are willing to pay more, go with the ecobee4. If you want a more affordable unit and can give up some of the fancy bells and whistles, go with the ecobee3 Lite. No matter which side of the teeter-totter you sit on, the ecobee3 doesn’t check any boxes that one of these other two models also don’t check. In addition, the ecobee3 is not even sold on ecobee’s website as a new unit anymore (only refurbished models are available). Still can’t decide? Shoot us a message and we’ll be glad to answer any additional questions or comments you may have about the products. We’re here to help!